Computex 2016: ASUS announces Zenbo, its first robot. ASUS today during the Zenvolution press event at Computex 2016 announced Zenbo, the first ASUS robot, priced at $599 (USD). While revealing ASUS Zenbo, Chairman Jonney Shih said, "For decades, humans have dreamed of owning such a companion: one that is smart, dear to our hearts, and always at our disposal. Our ambition is to enable robotic computing for every household." Zenbo is a friendly and capable home robot designed to provide assistance, entertainment, and companionship to families and meant to address the needs of each family member in this ubiquitous computing era. With a full range of capabilities, including the ability to move independently and understand spoken commands, Zenbo can assist in the home and interacting with him is easy and fun. Zenbo is designed for everyone, but he has specific functionality that helps senior family members safeguard their health and well-being as well as enjoy a connected digital life. As a home care assistant, he proactively provides convenient, spoken reminders of important information, such as doctor's appointments, medication and exercise schedules, and anything else that needs to be remembered. Zenbo also monitors the home for emergency situations - such as falls - and immediately responds to them by notifying specified family members on their smartphones, no matter where they are. When they receive an emergency notification, family members can remotely control Zenbo to move nearby and use Zenbo's built-in camera to visually check on their loved one. 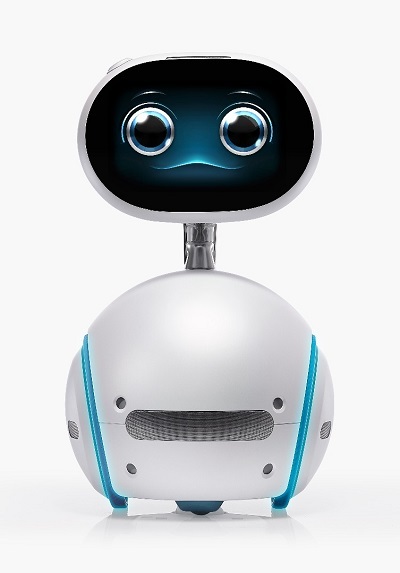 Zenbo is also a friendly companion who helps to bridge the digital divide between generations by making it easy to accomplish a variety of online tasks - including making video calls, using social media, shopping, and streaming movies and TV shows - using voice commands and guided help. Zenbo is also a fun and educational playmate for kids who entertains them with interactive stories and learning games that foster their creativity and logical thinking skills. With his high-quality, built-in stereo sound system, Zenbo can play children's favorite songs and even dance along to the music, making for fun playtime activity. Zenbo is also an expert storyteller who keeps children entertained during the day and helps them fall asleep at night. Zenbo includes a built-in library of stories that he tells in a variety of entertaining voices, while displaying accompanying images on his screen and controlling the room lighting to add a new level of interactivity and fun to story time. Zenbo also comes with educational games and an interactive encyclopedia that make learning fun. In addition to working with seniors and kids, Zenbo is also a hands-free household helper who enriches the home with a broad range of skills that make life easier and more enjoyable. Zenbo can connect to and control many smart home and traditional devices, including lights, TVs, air conditioners, and more. Homeowners can even use Zenbo's built-in screen to view visitors at the door and then unlock it with a simple voice command. He can also help out in the kitchen, reading recipes out loud and functioning as a voice-controlled timer, so home chefs can stay focused on cooking. With his built-in camera and ability to move around the house, Zenbo is a great family photographer who helps preserve special and everyday moments alike. When homeowners are away, Zenbo provides peace of mind that their home is safe by acting as a remote-controlled home security camera that is accessible from anywhere via an intuitive smartphone app. Zenbo supports a growing number of custom apps that expand his capabilities and bring new features to users.